This is a spotlight post: Stay tuned… you can WIN one on Monday! Hi, my name is Heather and I’m a coffee addict. It wasn’t until my 30’s that I developed this passion. Up to that point, I just hadn’t tried to proper blend of quality coffee, flavorings and creamers. Now my kids know that it is best to let Mommy start her coffee maker before asking for things in the morning. We have a normal sized 12 cup brewer that does a rather decent job when the three of us want some, but some mornings I really just need the one cup. One Cup Connection contacted me and asked if I’d be interested in reviewing a Keurig. I have heard fantastic things about this brewer so I jumped at the chance. I spent some time on their site and found out that One Cup Connection is an authorized Keurig distributor specializing in K-Cups and brewers. They are family-owned and operated and have over 50 years of experience in the coffee industry. Our family has been trying to “Shop Small” so I was pleased to work with them! The Keurig B31 Mini Plus K-Cup Coffee Maker arrived and barely made it past the threshold before Kaytlin and I ripped into the package. Our shiny new brewer was compact but stylish, just the perfect size not to overwhelm my countertop. One Cup Connection sent a box of Caribou Coffee Daybreak to try with the brewer. To my delight, I found a sampler box of assorted coffee was also included in the Keurig box. I am a coffee wienie… I’m always afraid to try something new for fear of disappointment. Now I had one of each to try without wasting an entire box if I didn’t like it! The Mini Plus Personal Brewer is perfect for gourmet coffee, tea and hot chocolate (yes, great for the kids, too!). It is compact and super easy-to-use. The size of the brewer makes it perfect for more than just at home… thinking vacation home, home office, RV, off campus apartment, loft living and more! You can purchase a Keurig Mini Plus Brewer in your choice of three colors: red, black or platinum. It has a removable drip tray, cord storage and features an auto-shut off for people like me that just don’t have their head on in the morning. The Mini Plus allows you to brew 6, 8 or 10 ounces to get the strength you desire… just pour the desired amount of water into the reservoir. No need to pre-measure before pouring… just fill until water bubbles in the center of the “cup” of the desired amount. 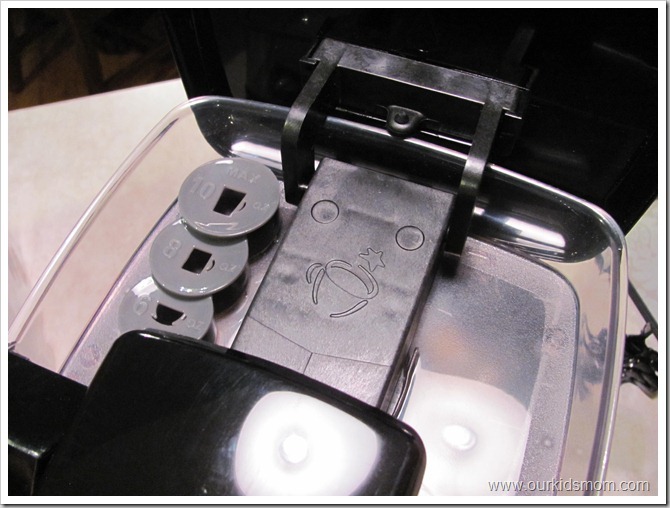 If you accidentally over pour, the Keurig has a run off that empties into the drip tray at the base of the unit. To brew up a cup simply turn on the Keurig, pour your water, lift the lever to insert your K-Cup (you will hear the water drain into the tank when you lift the lever) and close. The photo on the left shows the brewer ready to begin. Press the “brew” button and it starts the process (and shows you it’s working with a red light around the brew button). In less than 2 minutes you have a cup of coffee that can put a coffee shop to shame. You can see how hot the coffee comes out… the brewer is starting to steam a little in the photo above. My overall impression of the Keurig Mini Plus Brewer is very favorable. 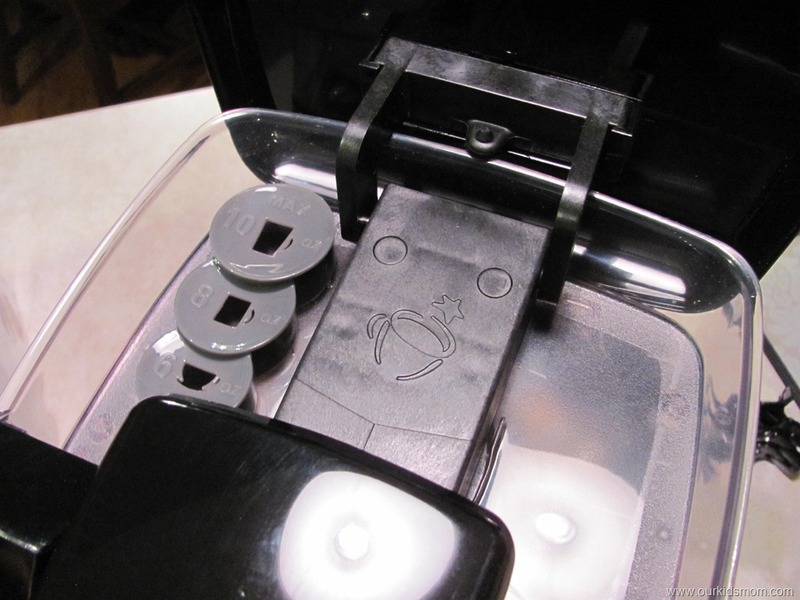 It’s super easy to use and is compact (space hogs are not allowed on my counters). The coffee comes in convenient K-Cups that are usable in all Keurig machines (so you can bring your favorite flavor and use it on the office machine if you have one) with a brew available for just about every taste. My only complaint is that the maximum water capacity is only 10 ounces. I have some big mugs. Even the mug above didn’t fill completely. If there was a way to push a little more hot water through that would be fab. For now, I’m just adding it manually. I the Keurig Mini Plus Single Cup Coffee Brewer! MMMMmmmm Coffee!!!! 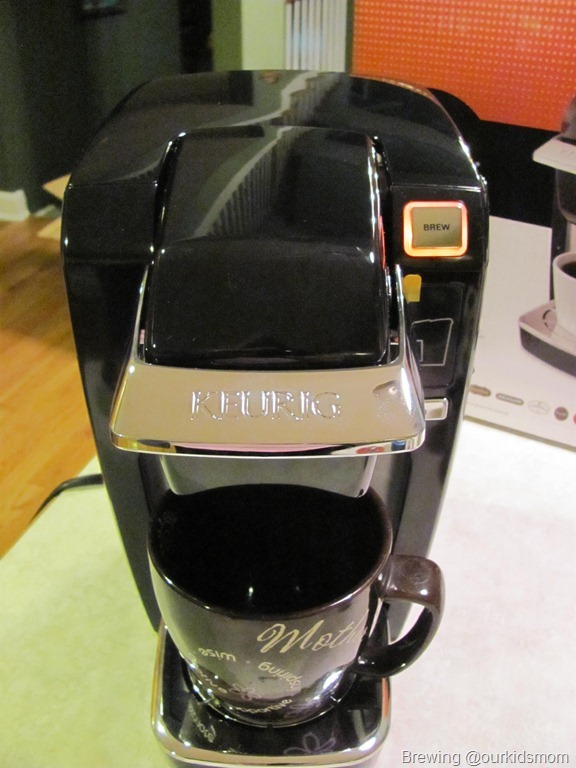 I LOVE MY Keurig, and when in time to replace it, it will be replace with ANOTHER Keurig! I don’t drink much coffee but my husband does. He has to drink coffee because of his work and is starting to be a coffeeholic. It’s a good thing that this can also make hot chocolate for me and my kids so this will be a family thing! thanks for the post! This is PERFECT for me!! I am the only person who drinks coffee in our home and I only drink one cup per day. I want one! Oh my goodness, that’s so cute!! I’d love a red one. I have a full size one. My daughter would love one like this!! Great review! I want to try this since hubby is the only coffee drinker! 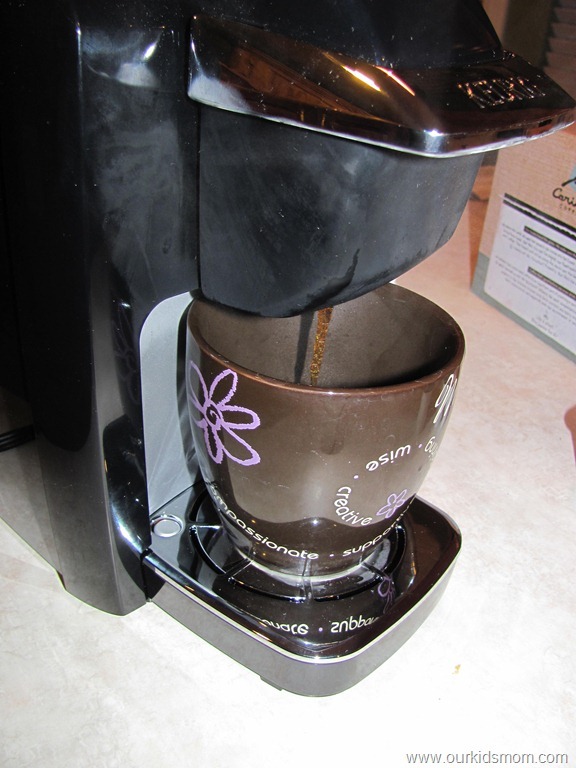 Love our Keurig at home… One of my hubby’s friends at work has one on his desk. I’d like to get one for my husband too. Thanks for the review! I’ve been wanting to try a Keurig brewer for a long time. They sound fantastic! I love the size of this mini brewer! Perfect for not taking up too much space on the counters! I love the sampler box. That’s just what I would get so I could have a different drink each morning. I will, I repeat, I will own one of these one day! I’m a coffee fiend…. Cute! This would be great for my office. 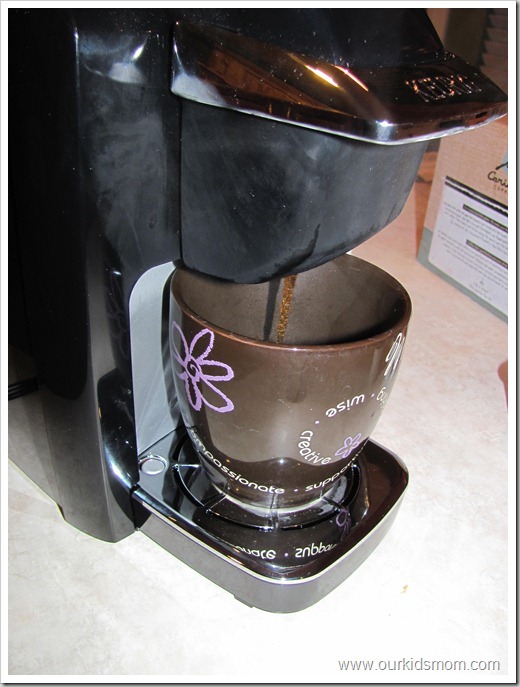 I love Keurig & I love that they offer the option to buy the refillable basket to save money. I was hesitant to get my own Keurig because they used to all be so huge! I like that you can also use it for hot chocolate. I like that you can also use it for hot chocolate! I would love one of these for my desk at the office. I would love to have the option to choose different coffee each day! Plus, it would save me money because right now I stop on the way because I drink decaf and my husband uses our pot for regular coffee – that’s too expensive! The nicest thing is my cups are large too. My boys could make their own hot chocolate and wouldn’t spill it all over the floor! Nice review, the mini plus looks like a perfect gift to save space. I like that you can brew 6, 8 or 10 ounces to get the right strength. My husband doesn’t like his coffee very strong but when my parents visit they like their coffee stronger so we have to try to make it in the middle to make everyone happy! What a great idea to save on coffee and time!! I also love the thought of being able to make hot chocolate since my kids and I love it, they would be excited to get hot chocolate out of the coffee pot!!! I love all the different varieties!! Wow! 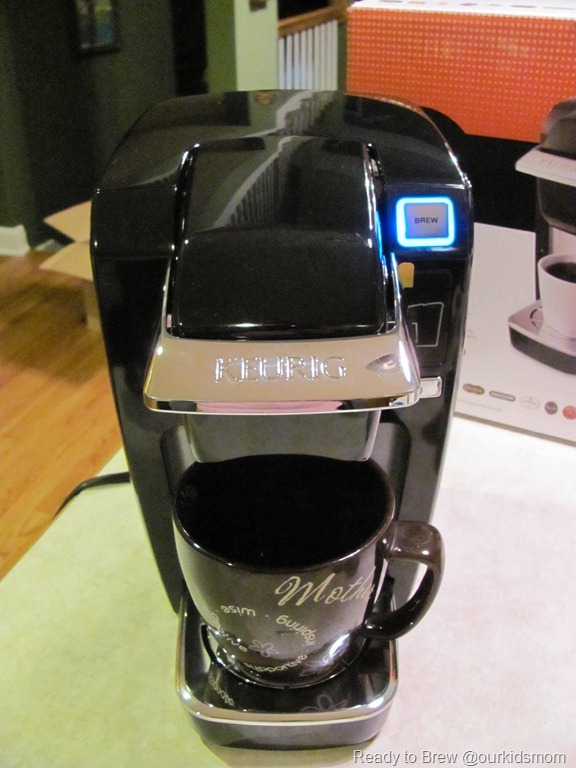 I like that it not only makes coffee and tea, but it also makes hot chocolate…..
Sweet little thing. Plenty of room for you on my counter. Great to take along for the hotels that don’t offer a coffee maker too. I really like the idea of a quick, good cup of coffee without having to make a whole pot. I love how you can do coffee and hot chocolate and not having to make a whole pot of coffee and its simple too. Great review….I love the size! how great is it that when family comes over i don’t have to stock a whole container of coffee and filters now? just these cute little cups? this is a great thing. such a HUGE time saver. I love that the mini keurig can make gourmet coffee, tea and hot chocolate! I love it! Wish I had one! I really like that it’s so compact and easy to use. i love this and i love the fact its a mini!! I agree with you about trying new types of coffee, so I love that they come in sample packs. There are many times I could just use a cup of coffee not a whole pot. Would love to have one of these!! This Mini Brewer is ideal for my grandmother that lives alone. She likes hot tea, cocoa, and once in a while coffee. This would be a great gift for her. I could always buy her new flavors of the wide variety of K Cups that are available. I also like that the strength of beverage can be adjusted from 6 to 8 to 10 ounces. I have always wanted to get 1 of these and had wondered about the amount of water in a cup possible. I like my coffee a bit weak and I too would like to have a bit more water to add to it. But I imagine adding a bit after its done will be just fine. Thanks for the review. I love the single cup because I can have coffee and my fiance can have hot chocolate. Thank you for the great review! I would love to have a Keurig. I learned that the Mini Plus allows you to brew 6, 8 or 10 ounces to get the strength you desire. This is important in our house as my husband likes his coffee very strong & I like it rather weak. I love that it is a small family owned company as the authorized dealer! I love that it is versitle you can use just about any brand and still make tea and hot cocoa. 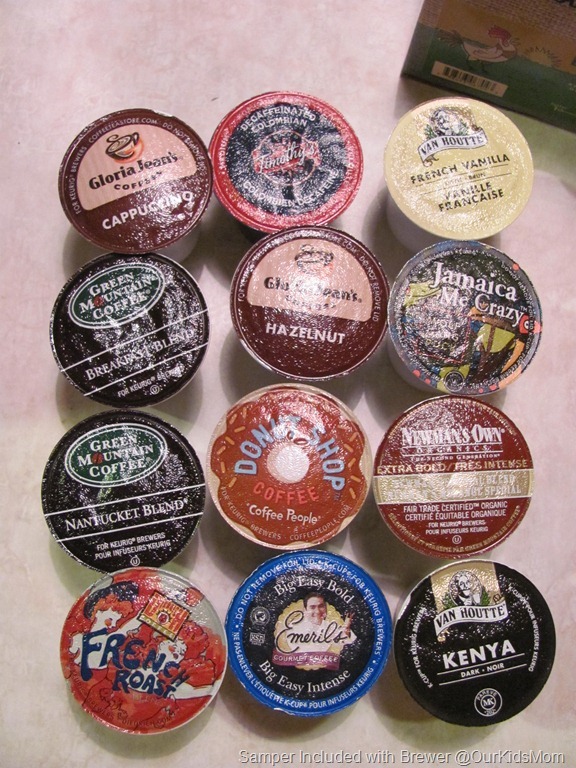 This looks awesome and I love how many varieties of K Cups that are available. Thanks for a great review. Great review!! Thanks so much. My mom has been wanting one of these, I love the variety you can have with this machine. Thanks for the review! I think the mini brewer is a great option, especially for the more budget conscious consumer — even though the 10 oz limit is a drawback, the convenience and affordability of this Keurig more than makes up for it. I think this is so neat, my son would love it. I am the only coffee drinker in my house and sometimes even though I want more, I don’t always get more than one cup, this would be perfect! Brewqing a cup at a time would be great!! Thanks for the review, I’d love to try a Keurig! And that is neat that you can try out new things simply a cup at a time instead of a whole bag of beans! I have been wanting one of these for so long. And I love that you can also make tea. I love both coffee and tea, so this would be great. Plus hot chocolate for the kids too! I love the compact size! A perfect cup of coffee each time, and no waste. I can’t wait to have one of these. I’ve never tried one of these and I would love to try it for Hot chocolate. I love the 1 cup system. Always fresh and hot! Would love this wonderful machine!!!! One cup at a time is awesome!!!! Looks easy to use and convenient. Thanks for the review. 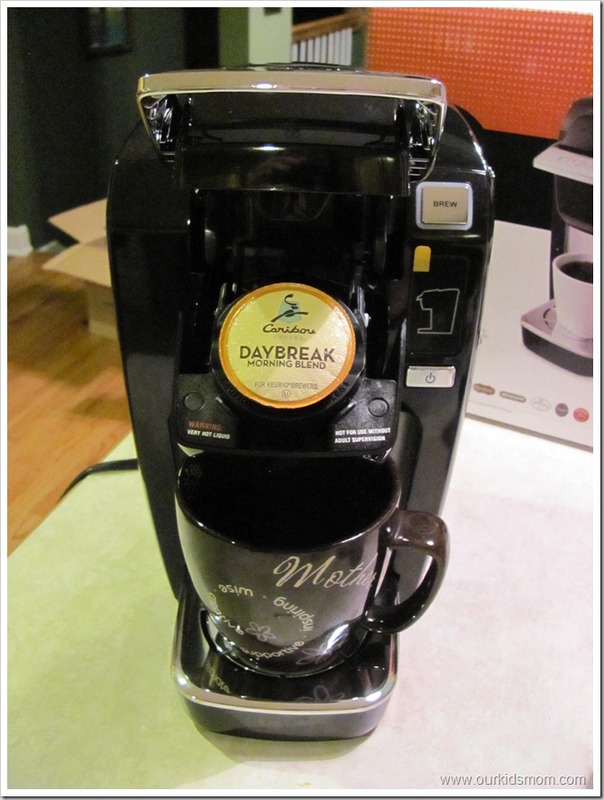 Do you know how delicious the coffee is in a Keurig! I had a cup from this coffee maker and it makes the best coffee I have ever drank! Even better coffee than Starbucks! I love that is doesn’t take a lot of counter space!! I also love that you can make tea, hot chocolate, and apple cider so you have more of variety than just having to drink coffee! I love coffee, but when I have guest over some of them don’t so this is the perfect choice! My son has a Keurig and I absolutely love it. It makes a great cup of coffee. Thank you for the opportunity to win one. sometimes all you want is just one cup… I drink hot cocoa and hubby drinks coffee, this is perfect for smaller families like us. I love how adorable it is! The smaller size is a huge favor as I never want something so large that it’ll take up a hulk of my counterspace–i’m usually in short supply as it is! I love that it makes both coffee and tea. I am a coffee drinker, but my husband is a tea drinker, but only a cup here and there while I could drink a whole pot. This would be just perfect for us, even the hot chocolate for the kids! This looks perfect. Sometimes you don’t want to make an enitre pot of coffee. Or even boil the kettle, just turn on this little machine and have a fresh cup of coffee! perfect for a single person…. Something like this would work great for our house since I am the only one who drinks any kind of hot beverage. I would love to have one of these. One cup at a time. This sounds like it would be PERFECT for me! I am the only one in the house who drinks coffee and because my kitchen is so small, I have VERY limited counter space! And the added bonus is that I could easily make just ONE cup of decaf at night! 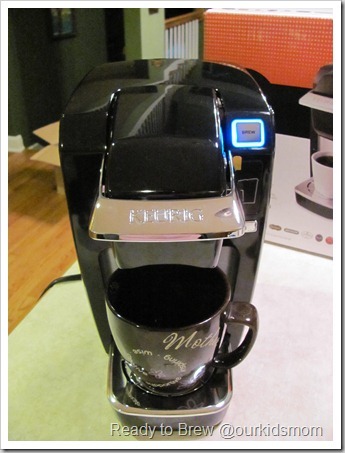 Great review of the the Keurig system. We have one of these at work so I am quite familiar with these brewers. We do not have one at home we usually go to Starbucks on the weekend to get coffee having one of these would be great. I don’t even own a coffee maker. I like an occasional cup sometimes but not enough to buy a big one. This would be great for me especially since it also does tea & chocolate. I love coffee, can’t start my day without it. I would love to own one of these machines! Something like this would be perfect for our whole family! i love the white hot chocolate k cups! YumMmy! I have also been wanting the little Kuerig every since I tried it in the hotel! Its perfect size for my counter. love that i can make my favorite gormet coffees! would love this! I would like to see the mini hold more water also. This is a great review. One of these would be perfect for me at home and take with me camping in the camper. i appreciate your review, about how it’s easy to use. So many of these coffeemakers scare me, too complicated. I love that it comes in several colors. I have a Keurig Mini at work and my biggest complaint is that the space for your mug is too short for travel mugs, even if I take out the drip tray. I don’t like using regular mugs since the coffee gets too cold to fast, so I have to end up brewing the coffee into a mug and then empty the coffee into the travel cup that will keep the coffee hotter longer. Also the 10oz limitation is good I think since putting any more water through a k-cup would probably yeild pretty darn weak coffee. This looks so cool! Much less waste than making a whole pot and then tossing almost half of it out like I do! I would love to be able to make a cup at a time! My hubby is the only one who drinks coffee so this would be great for him! Loved the review! Hubby and I were looking at Keurig’s and couldn’t figure out if the mini was worth it. I think it is so thanks for the info! I would love a Keurig. They are so convenient. Love the single cup coffee brewing! Thanks for the review! Again, I love that they have so many variations of tea, and offer up different options other than coffee. Some days, you just don’t want coffee, and its nice to know that you still can use this machine and make other things, so its not just a one trick pony, so to speak. My neighbor has one & the Chai Lattes are AMAZING!!! I didn’t even know they made a mini. I love it for it’s size and convenience and… it’s super cute! My girlfriend has been wanting one of these! It’s convenient and I like how you can choose the strength you like pretty much! To have a couple in less than 2 minutes would be great. I really like that Hot Chocolate is an option. My hubby likes very strong coffee. Me not so much. It would be nice to be able to make something different each time. Thanks for the review. Like the simplicity and easy clean-up. This sounds awesome! I always make a huge pot of coffee, but never drink this would save me from wasting it! i do not have a coffee machine right now soooo i really want this! i love it. Nice review, thanks! I always wanted a Keurig. My mother and sister have one and love it. I like the compact size. Perfect for leaving out on the counter. This is PERFECT for my husband! He is the only person who drinks coffee in our home and It would be perfect for him. I want one! Would LOVE to have one of these. Each person can have exactly what they want in the morning, and it doesn’t take up much counter space. Oh, you have convinced me that I need one. I love coffee on demand. I really like all the flavors available. I too have bigger cups but will add extra water like you do. This would be super handy to have. Currently we use french press travel mugs. On weekends I would be happy to just have a cup of coffee as to having to make it in my mug. Our home press broke last year and we have yet to replace it. I’d like to know if you can remove the drip tray to accomodate a travel mug like you can on the regular keurig. I love the kuerig at work – now I just need one for home! I love that the Keurig can make tea and hot chocolate in addition to coffee. Very nice! I would love to have one of these, I’m the only one in my family that drinks coffee so it always goes to waste! I love hot chocolate and hot or cold tea. 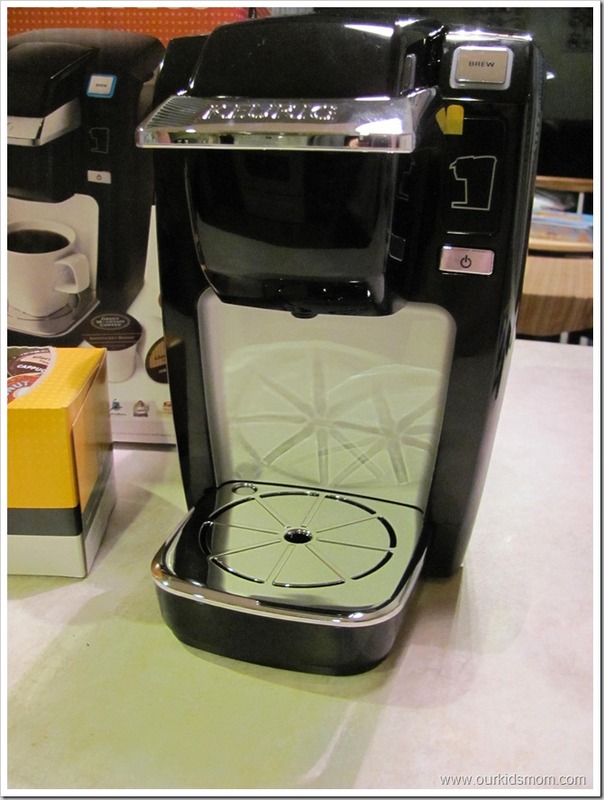 Not much of a coffee drinker but would love to win this for company and to make myself hot cocoa or hot tea. Great product. Thank you for a great review. This is SOOOO very perfect for my husband. We are both coffee drinkers, but I like my coffee VERY strong & drink it all day, while the hubs likes a cup not quite every day & likes it rather medium roast/breakfast blend style. I can have my strong french press/pot & he can have his “lady” coffee. heehee! THanks! 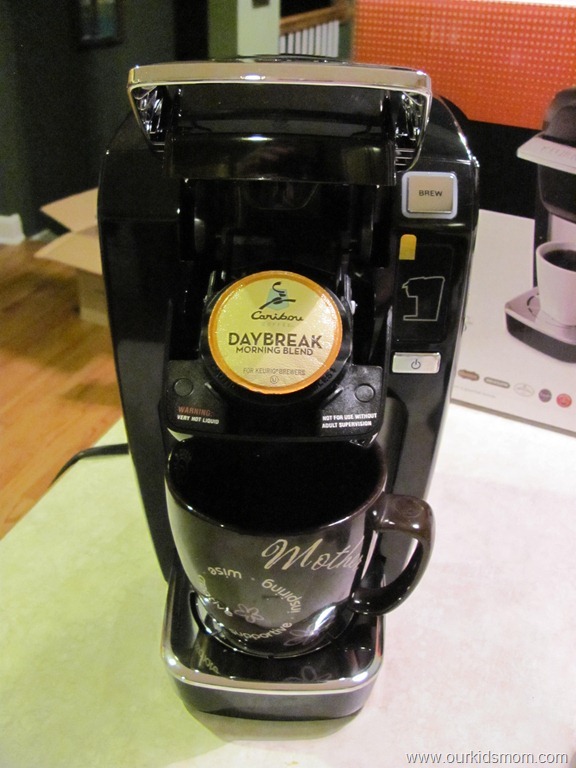 I love the Keurig Brewer. Makes it easy for everyone in the house to make their favorite coffee/cocoa each morning. Oooh It looks so nice and convienent. wow I really would love it so much. Your review makes me want one now! I didn’t know about the different cup strengths! That’s ingenious! I love how compact it is while still being easy to use. 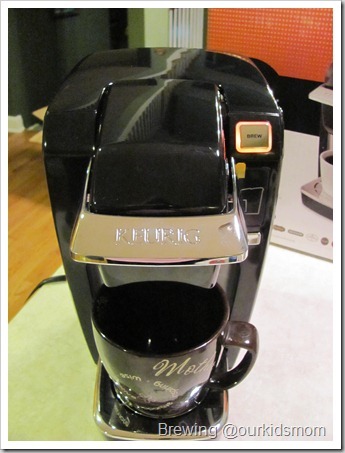 I have heard the most wonderful things about the Keurig and according to your blog it really is great! I hope to one day be able to test the “waters”!!!! I would love this in Platinum in my kitchen! Love that it does 1 cup at a time so I’m not brewing a whole pot just for me. We always try to make 1/4 or 1/2 pots in the 12 cup but they never taste right, Thanks for the review, i like that it makes 1 cup at a time. I love the variety of coffee which is available for it. Love that in 2 minutes you can have a great cup of coffee that tastes like coffee not like the old instant coffees did. I also love the Hot Cider K-cups. I had it for the first time at a friends house and absolutely loved it!!! 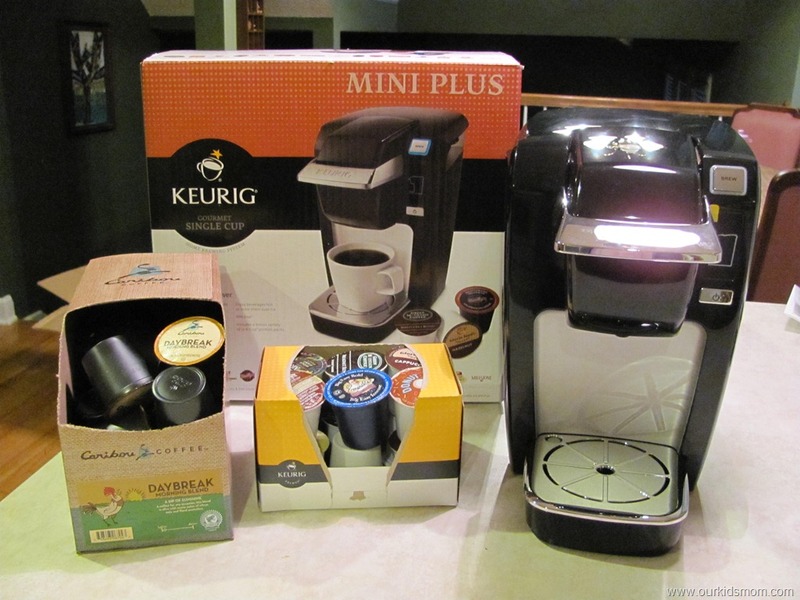 i would love to win this.. i love my big keurig.. 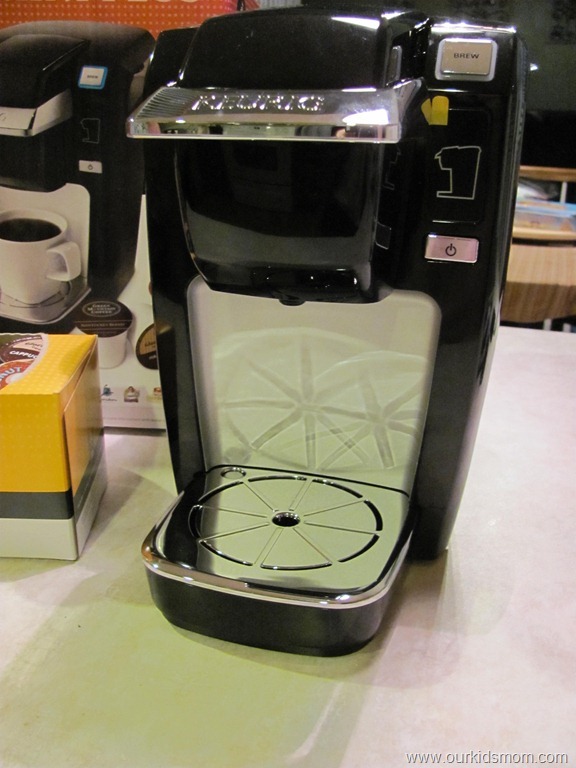 I really want one of these Keurig Mini’s. I love a cup of coffee (or two) but rarely a whole pot so much of it goes to waste. I also love trying different flavors and like being able to try a single serving rather than buying a whole bag that goes to waste if I don’t like it. I like that you can make so many different varieties of coffee/tea/choco- one cup at a time- we all like different things around here. I would love to have a Keurig, I love Hot Chocolate and my husband loves his coffee. Make both in one. Just us, so it would be perfect for us. I’ve wanted a Keurig Brewer for several years and just haven’t put the money into it. I know I’d be like you, ripping into the box as it came through the front door. The only thing I can think of that I would wish for is a 20 oz setting to fill my large travel mugs. I love this brewer. I hope one day I’ll be able to buy a Keurig! I love all the different flavors available. It looks so easy to make any hot drink with it! This would be great for the summer when hubby and I drink less coffee. Plus I would love to try all the different kinds. 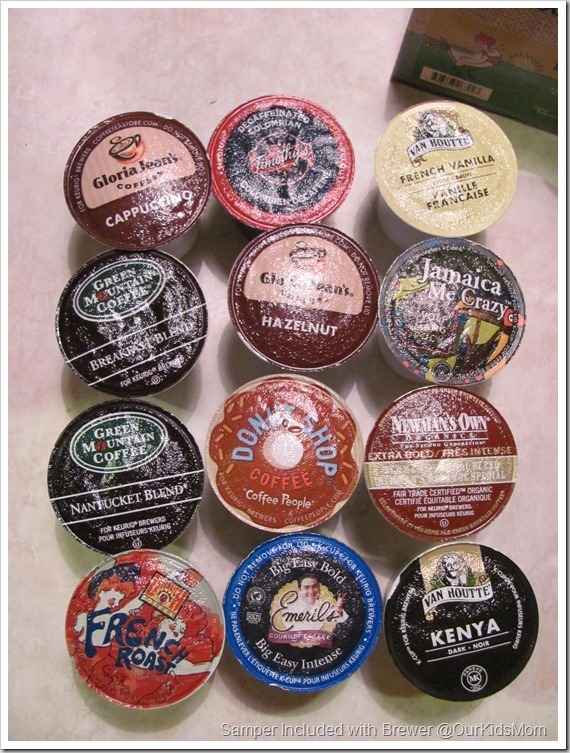 I love the many one cup varieties and that they just be popped in the coffee maker. These things save my sanity in the morning! I hate trying to get it together enough to make a pot of coffee! I like that it gives you a choice of water size. I like that you can get Caribou coffee too, my favorite brand! thanks for the review on this size Keurig. I agree with Amy below me, I would use this for hot chocolate for me and coffee for my guests. I’ve been dying to get one of these but haven’t been able to afford one. i have one of these in my classroom and LOVE it!! I love that it makes coffee, tea or hot chocolate! Not to mention, how fast it brews the coffee! This sounds great! Ahhh, I just noticed they have Apple cider K- cups too! I may just be in heaven! This looks like a really easy and quick way to make a cup of coffee in the morning. I like the mini because it is less expensive than the other models.